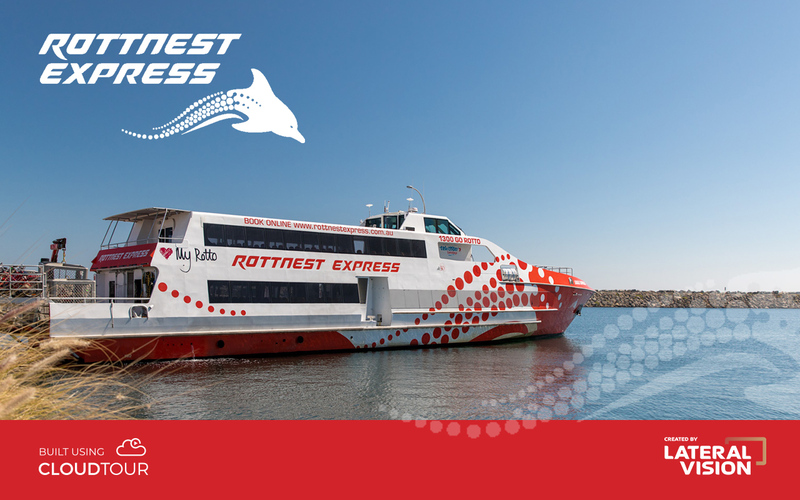 The Rottnest Express virtual tour takes customers on a trip across to Rottnest Island and features a 360-degree tour of the boats, terminals and the stunning features of the island. This CloudTour makes the most of high quality 360 photography to create a unique tourism marketing tool. The REX CloudTour needed to not only show the boat options and facilities but also be easy to use and navigate on desktop, mobile and tablet. We incorporated an easy to follow user interface with a simple menu to navigate to different boats, tours and island highlights. Keen attention to detail and the quality of the images were important for this CloudTour, including capturing on a beautiful, sunny day. The tour is accessible via a URL link, meaning it can be added to a website, shared on social media or distributed and used by customers and travel agents worldwide. Offline versions of the virtual tour were also supplied so it could be accessed on tablet devices at a trade exhibition. Rottnest Express couldn't be happier with the 360 degree project Lateral Vision (Alex) recently finished for our business. The work was completed in a professional and very timely efficient manner with minimal direction provided by us. Alex has made it possible for our customers to get a real feel for the experience and service that we offer and has exceeded all expectations. Many Thanks! !